Black Children are an Endangered Species???? 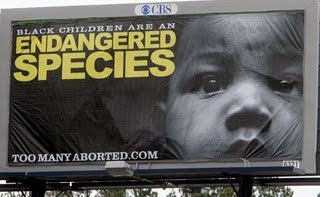 So I just finished watching this ABC News broadcast about the billboards being put up all over (UNDERPRIVILEGED) Black communities that have the face of a Black child with the words "Black Children are an Endangered Species" along with the website "TooManyAborted.com" under it. The billboards were created and put up by Black MEN and are friggin everywhere! EVERYWHERE among Black communities.. POOR Black communities in particular.